Biscuits are one of my favorite comfort foods, especially when they’re still warm from the oven. Crunchy and golden on top, soft and buttery in the middle — just perfect. They’re also a great vehicle for a number of add-ins. We got a few really huge portobellos in our Greenling box, so I thought this would be the perfect way to use them up. Heat the olive oil over medium heat in a skillet. When hot, add the mushrooms and saute until they’re soft (~3 minutes). In the last minute or so of cooking, add the thyme to the skillet and toss with the mushrooms. Set aside to cool a bit before adding to the biscuit batter. Combine flour, baking powder, sugar, baking soda, salt and pepper in a large bowl. 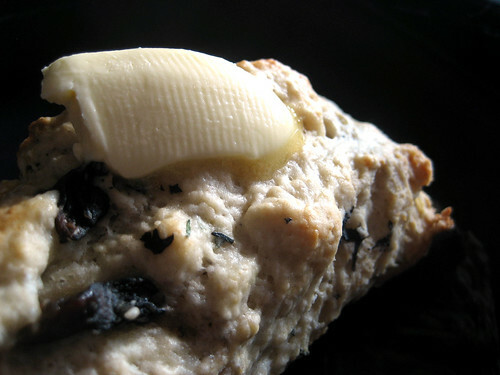 Incorporate the butter into the dry ingredients with your hands until it’s crumbly. Add the cooled mushroom-thyme mixture and the buttermilk. Stir with fork just until a sticky dough forms. Turn the dough out onto a lightly floured surface (I needed much more flour than “lightly floured” to knead it) and knead gently 8 times with floured hands. Do not over-knead! Form into a round, about 3/4-inch to an inch thick. Cut the round into 8 wedges. Use a pastry brush to brush on some extra buttermilk over the surface of the wedges. Bake for ~20 minutes, until the tops are golden brown. The woodsy thyme is a perfect compliment to the hearty portobellos. The texture is light and the outside is golden and crisp. Heavenly! I encourage all of you to use the base recipe and mix it up from there! 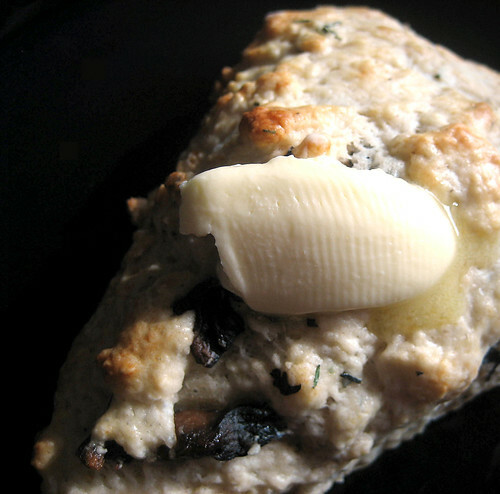 Add veggies or herbs for savory biscuits, or a sugar or fruit for sweeter ones. This week, we’re getting okra from Bradshaw Farms, summer squash, onions and red potatoes from Naegelin, bell peppers from My Father’s Farm, elephant garlic, portabello mushrooms from Kitchen Pride, tomatoes from McCall Creek Farm, herb from Pure Luck, pears from Lightsey, lettuce from Bluebonnet Hydroponics and green Meyer lemons from G&S Groves. 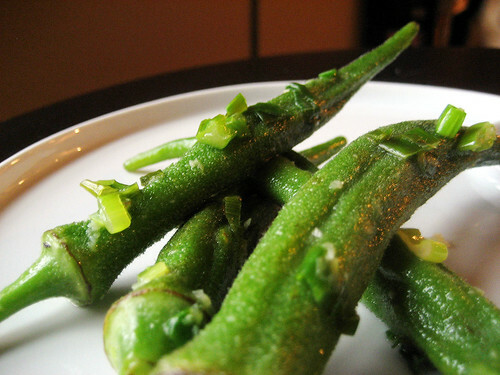 Pickled okra — I had the best pickled okra at the Pearl Farmer’s Market this weekend and I was inspired to make my own. I’ll use the lettuce and bell peppers to put on my wraps for lunch, and the garlic and onion while making dinner. I’ve tried okra a few ways now. My least enjoyable was boiling it, then dipping it in a soy-based sauce. Blech. Slime central. I saw this recipe for steaming it and was intrigued — perhaps a gentler form of cooking would cut down on the slime? The original recipe calls for matchsticks of fresh ginger root to be tossed with the green onions and the okra at the end of cooking. I don’t care for the texture of ginger matchsticks without cooking it, so I just grated the ginger over the okra and green onions. Heat about 2″ of water in a pot until boiling. Place a steamer basket in the bot, then put the okra in the steamer basket and cover the pot. 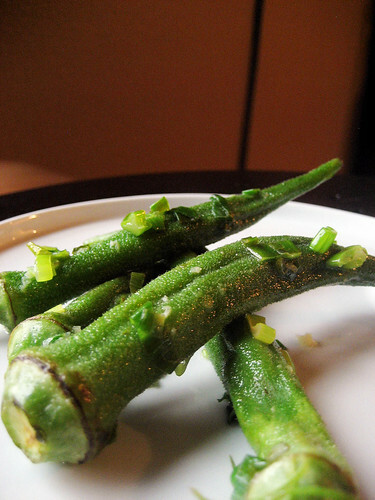 Steam the okra for 7 minutes. While the okra is cooking, heat the oil in a skillet. When hot, add the green onions and saute for 2 minutes. When the okra is finished steaming, set aside in a bowl. Toss with the sauteed green onions, grated ginger and lime juice. Add salt to taste and serve immediately. I really loved the zing from the fresh lime juice and the spiciness of the ginger. The slime factor was definitely cut down, but there was still a bit there. Oddly enough, I didn’t mind it so much, as it allowed the green onions to stick to the okra more. It’s still raining, which ruined my plans to grill dinner last night. Grilling corn is so easy and imparts a nice charred flavor. I chose to use the second-best option: the broiler. It’s basically a grill, just inverted so the heat comes from the bottom instead of the top. Oh, and that fire business. Place the trimmed corn on a broiler pan or a rack on top of a baking sheet. Broil for 15-18 minutes, flipping the corn halfway through baking. 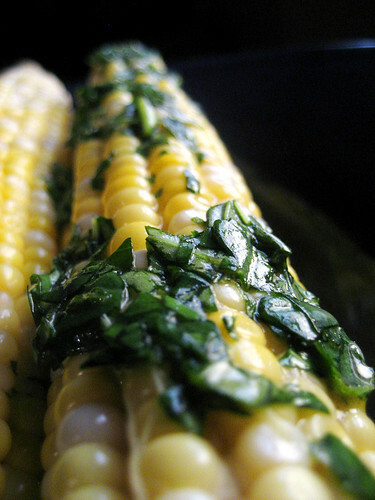 While the corn is broiling, combine the butter, herbs and salt and pepper in a small bowl and set aside. When the corn is finished (I test to make sure it’s done by peeling the husk and tasting a kernel), remove the husks and silk and spread with the herbed butter while still warm. Herb compound butter is so easy to make and a great way to give a flavor boost not only to corn, but to biscuits, fish, chops, anything where you would use a finishing butter, really. The ingredients are endless, too. Adding red pepper flakes or minced garlic will give it a nice kick, while adding cumin or chili powder will impart a smoky flavor. Get as creative as you like! It’s cold and rainy outside, so this meal plan reflects the weather! Lots of soups, stews and stick-to-your ribs food. You know as soon as I get my Local Box on Thursday we’ll be in the 90s again. Oh well. This week, we’re getting sweet corn, summer squash from Naegelin, southern peas from Animal Farm or Lightsey, purple eggplant, herb from Pure Luck, tomatoes from McCall Creek Farm, lettuce from Bluebonnet Hydroponics, pears from Lightsey, a variety of citrus from G&S Groves, green chiles and serranos from Lundgren, and pickling cucumbers or radish from My Father’s Farm. I use citrus in so many of my dishes that I can’t think of anything I won’t use it in! I love pasta salads. They’re perfect for 2 people or big group gatherings, and they make great leftovers for lunch the next day. 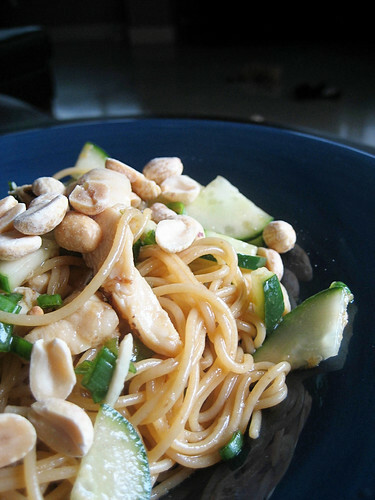 This one has an Asian spin and uses sesame oil and soy sauce to pack lots of flavor. This recipe comes from Cooking Light, and as I’ve mentioned before, they don’t really like when food bloggers use their recipe on their websites. As such, I don’t use a ton of Cooking Light recipes. This one was too good to pass up though. You can head on over to the website for the full recipe. My local grocery store didn’t have udon noodles, so I subbed whole grain thin spaghetti. It was nice, but I’d like to try this with udon also. We got a few nice cucumbers in our Greenling box this week, and this recipe was the perfect way to highlight their crunchy texture. 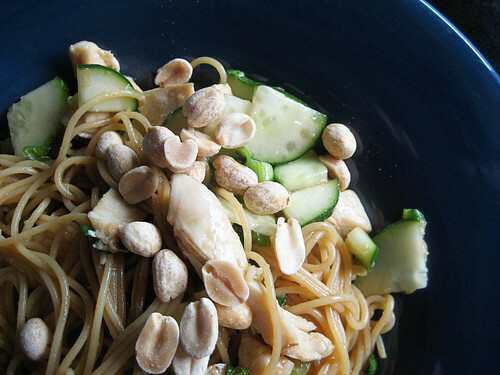 Along with the cucumbers, I tossed the cooked pasta, grilled chicken slices, and chopped green onions in a sauce of toasted sesame oil, rice wine vinegar, a bit of honey, soy sauce and grated ginger. After topping with peanuts, we were ready to eat. While pasta salad is traditionally a side dish, this was a filling lunch for us. Whole wheat pasta is much heartier than pasta made with white flour, and the chicken provides some protein, so there’s not much else needed. The sauce is a light but really flavorful base for the pasta and veggies. The only change I’d make in the future is toasting the peanuts before putting them on top of the noodles for another layer of flavors. It’s the middle of September, and I’m craving things like squash, sweaters and changing leaves. Unfortunately for me, it’s still unbearably hot out — way too hot for a hot meal. Salads are one of our go-to meals during the summer, and luckily for us, last week’s Greenling box was stocked with veggies perfect for salad. 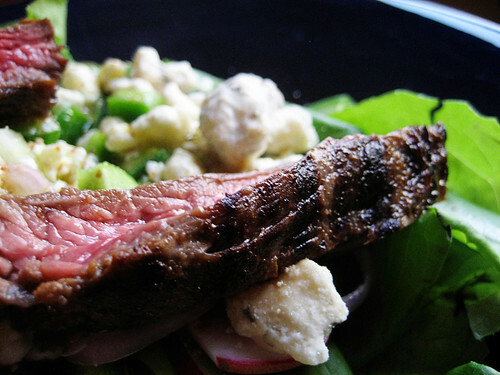 Loaded with veggies, a light vinaigrette and a hearty blue cheese rounds out a perfect steak salad. Lettuce and other salad veggies (we got some beautiful green bell peppers and radishes in our box, along with a big head of Bibb lettuce). Thinly sliced shallots are great with the steak, as are blue cheese crumbles. Whisk together the soy sauce, garlic powder, onion powder, ground ginger and pepper in a bowl. Add the flank steak, trimmed of excess fat, and marinate for 15-30 minutes. While the steak is marinating, prepare the salad. Whisk the ingredients for the vinaigrette together and set aside. Grill the steak over high heat for ~4 minutes per side (for medium-rare steak), then let rest for 3 minutes. Toss the salad in the vinaigrette, then slice the steak against the grain and serve. I made the first cut, then realized that I was cutting it the wrong way (with the grain). Oh well. I’m a do-do. Nice, light meal for the dog days of summer. 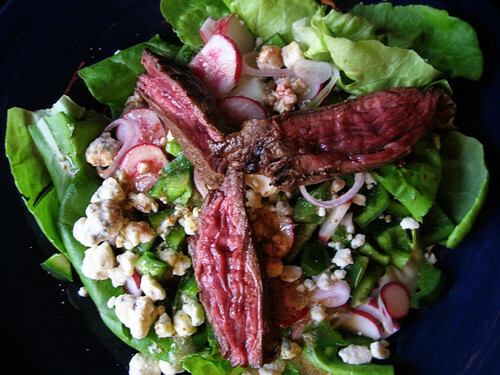 Flank steak is perfect for salads because you don’t need to gnaw at it to chew it, even when it’s rare like mine is (okay, mine is really rare. Don’t hate.). This marinade has strong flavors that stand up well to the other strong flavors in the salad, like the radishes, shallots, dijon, and blue cheese.